(SYDNEY, AUSTRALIA) – Former UK galloper Alexander Of Hales will run in Queensland this weekend in the Listed Caloundra Cup (2400m). The Chris Waller-trained import, a six year old Danehill stallion, has been entered for both the $200,000 Listed Caloundra Cup over 2400m and the $100,000 Listed Winter Cup over the same journey on his home track of Rosehill. 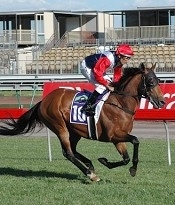 But Waller has opted to send Alexander Of Hales north for the bigger field and the possibility of a more genuine tempo. “He arrived in Queensland this morning and he’s done well,” Waller said. “He’s a very one paced horse so I’m keen to see him in a strongly run race and rolling along instead of being held up for a sprint home. Waller said he expected jockey Brad Pengelly would have the gelding on the pace from barrier three. Alexander Of Hales was runner-up in the Irish Derby at his final run in the UK but is yet to place in 10 starts in Australia, firstly being prepared by Danny O’Brien and more recently with Waller. His last two have been closest, though, finishing fourth in the McKell Cup and fourth in the Stayers Cup, both over 2400m at Rosehill. In the Winter Cup, Waller will be represented by Come On Cugat who was runner-up in the Stayers Cup last start.